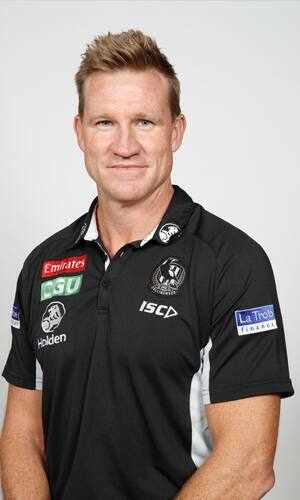 Without doubt one of the greatest players to don the Black and White guernsey, Nathan Buckley made headlines in 2009 when it was announced he would hold an assistant coach position at Collingwood for two seasons before assuming head coaching duties for the following three years. Between his retirement and his return to Collingwood, Buckley joined Channel Seven, 3AW and The Age as a commentator and analyst and remained a key figure in AFL ranks. His acquisition was described as a major coup by the club, with the six-time Copeland Trophy winner working closely with Mick Malthouse before becoming the senior coach in 2012. Buckley took over a forward line which became the second highest scoring side in the competition in 2010. The following year his apprenticeship focused on opposition scouting. Buckley immediately made an impact as the senior coach at the completion of the 2011 season by adding three new development coaching positions. He also acquired the services of former senior coach Rodney Eade as the club's first Football and Coaching Strategist. Buckley led the Magpies to a Preliminary Final during his first season as senior coach, before making the finals again in 2013. After a stint outside the eight, Buckley's Magpies roared back into contention in 2018, finishing only five points short of a remarkable premiership against West Coast in the Grand Final. Playing Career: Brisbane 1993 (20 games, 21 goals), Collingwood 1994-2007 (260 games, 263 goals). Total: 280 games, 284 goals. Honours: Brownlow Medal (2003) tied, Norm Smith Medal (2002), AFL Rising Star Award (1993), All-Australian Team (1996, 1997, 1998, 1999, 2000, 2001, 2003), All-Australian vice-captain (1999, 2000, 2003), International Rules Series (1998, 1999), International Rules Series captain (1999), Allies State of Origin Representative (1995-1997), Allies State of Origin Captain (1997), Alex Jesaulenko Medal (1997), Copeland Trophy - Best and Fairest (1994, 1996, 1998, 1999, 2000, 2003), 2nd Best and Fairest (1997), 3rd Best and Fairest (2001), Collingwood Team of the Century (half back flank), Collingwood Captain (1999-2007; 161 games). Coaching Career: AIS-AFL Academy squad (assistant) 2008-2009, Vic Country U16 (coach) 2009, Collingwood assistant (forward line and opposition) 2010-2011, Collingwood coach (senior) 2012-2018). Coaching Record: 4th (2012), 8th (2013), 11th (2014), 12th (2015), 12th (2016), 13th (2017), 2nd (2018).